A cute little romance. Richard Benson (William Holden) is a screenwriter who is slightly past his prime. He has been hired by producer Alexander Meyerheimer to write his next movie. Meyerheimer thinks that Benson has been holed up in a Paris hotel room working hard on the screenplay. In reality he has been living the high life in the City of Lights. Now he only has three days to write his next hit. When Richard realizes that he is in trouble he decides he needs help. He hires a typist to write while he talks. The secretarial service sends over Gabrielle Simpson (Audrey Hepburn). As they start working on the screenplay they begin to fall in love. Now they need to work against time and their feelings to get the screenplay done in time. I liked this little film. 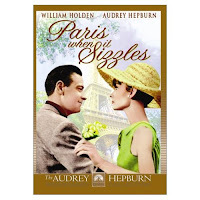 Holden and Hepburn had wonderful chemistry. The scenery was wonderful also. The movie in a movie can be confusing at times but if you pay attention it is easy to follow. This movie was a remake of a 1952 French film titles La Fete a Henriette. There was also a remake of this movie called Alex and Emma in 2003 starring Luke Wilson and Kate Hudson. However, this film is a must see for all classic film buffs.